We provide comprehensive infant and toddler exams, and treatments for a wide range of developmental conditions. Children are not born with the ability to see. They learn to move their eyes, judge the world in 3D, and direct their hand and body movements with their eyes. Children cannot tell if they are not seeing clearly, or if they are using their eyes correctly. By the same token, parents cannot judge if their children are seeing properly. A child may point out airplanes in the air, or small details, but they may only be seeing out of one eye. How Important is Good Vision for My Child? It is crucial that vision is developed correctly for a child to learn to read, write, and play sports. 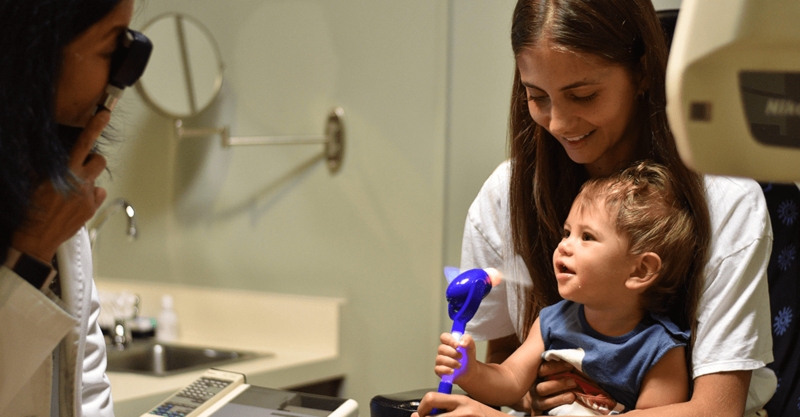 The American Optometric Association recommends a child’s first vision exam is at 6 months to make sure their child’s vision, eye health, and fine motor visual skills are developing at an age-appropriate level.